German tech site ComputerBase spotted that NVIDIA showed off a Tegra roadmap at the Citi Technology Conference. One slide reveals Kal-El+, an upcoming SoC designed for notebooks with the ARM edition of Windows 8. The Wayne chip is now planned for late 2012 or early 2013, and in 2013 we'll also see Grey, a chip designed for the smartphone market. Grey offers 3G/4G communication and the site claims NVIDIA is also working on its own smartphone operating system. 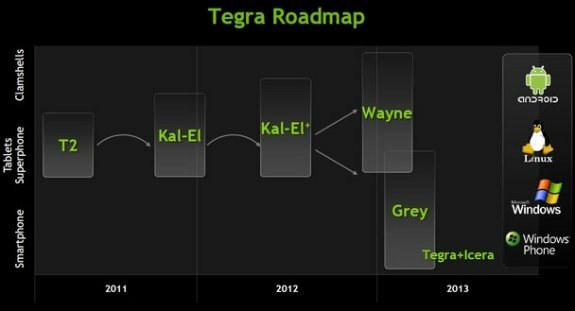 Additionally, NVIDIA confirmed Kepler is still planned for Q1 2012, the Quadro editions will follow in Q2 2012 and the Tesla variants in Q3 2012.